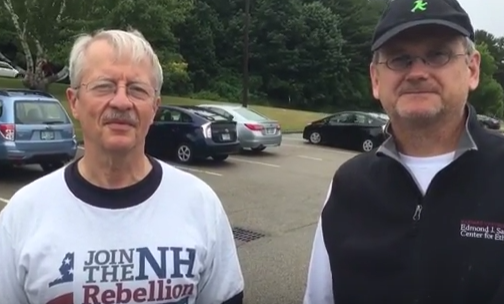 Joe Magruder, left, and Larry Lessig, founder of the New Hampshire Rebellion, get ready to march in Portsmouth last July in this file photo. 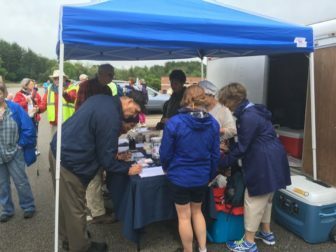 Several dozen activists gathered at Portsmouth High School on Saturday readying for a 5-mile march and rally against what they call government corruption. The group, founded by Larry Lessig, has held several such events to protest the influence of money in elections. Roger Wood InDepth caught up with Lessig, a Harvard Law School professor who ran as a Democrat for president, but withdrew before the primaries, and former Associated Press editor Joe Magruder. People get ready for a 5-mile march in Portsmouth on Saturday with the NH Rebellion.